Is that blob on the beach dangerous? What’s the best treatment? 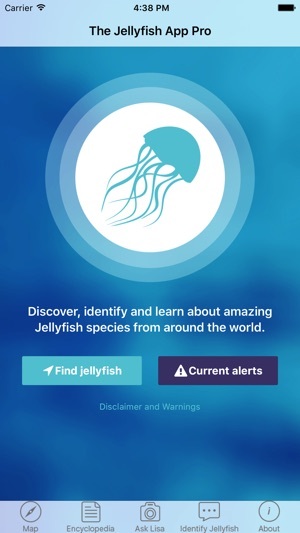 The Jellyfish App is a one-stop-shop for safety and identification of jellyfish of the world. This feature-rich app puts expert knowledge at your fingertips so you can make informed decisions that will help you have a good, fun, safe time at the beach. •	CURRENT ALERTS: With one tap from the Home Screen, instantly see which species and localities have current alerts. 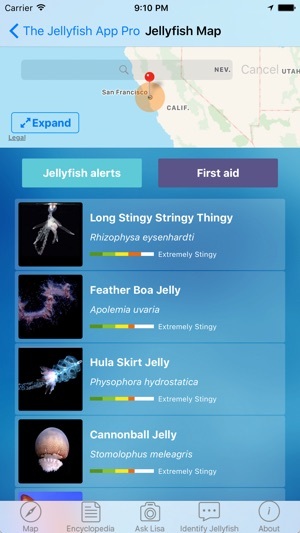 •	JELLYFISH NEAR ME: Instantly check what species are found near you, while an interactive map allows you to tap or type a locality to see what jellyfish occur anywhere in the world. 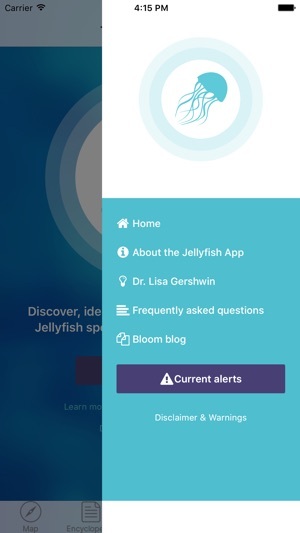 •	ASK DR LISA: Upload photos or questions for direct access to Dr Lisa-ann Gershwin, an international jellyfish expert with 25 years’ experience. You’ll not only get personalized answers back, but as well, your photos and observations will assist in tracking these fascinating creatures. You’ll be acting as a “para-scientist”, and helping science! •	SPECIES INFO: Each entry contains common and scientific names, a photo, description, seasonality, locality, toxicity, sting treatment, and other interesting information. 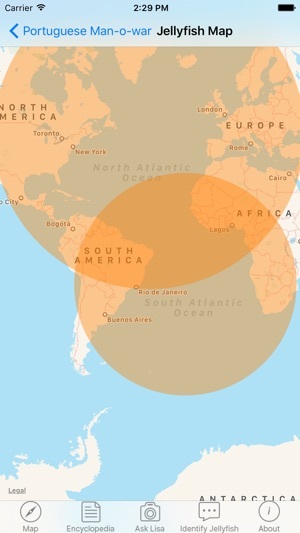 •	ENCYCLOPEDIA: Instant access to a wealth of useful information about jellyfish around the world. Hundreds of species are already included, from pretty ones to dangerous ones, and more are being added regularly. 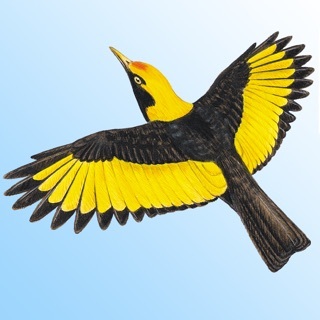 •	SEARCH: Find species by common name, scientific name, or image. A text search function helps even if you only know part of a name. Preloaded search options for color, size, and shape enable you to find species by feature (for example, all coin-sized species, or all purple species). •	FAQ: Should you pee on a sting or does vinegar really work? Wondering when is the best time to swim, or what sort of protective clothing to use? Check out the Frequently Asked Questions for the answer to these and other queries. •	MULTIPLE LANGUAGES: The Jellyfish App is now available in English, Chinese, French, and Spanish. Want to know more? See our webpage at TheJellyfishApp.com. Fixed issue with photo upload on Ask Lisa screen. This is an extremely helpful, and user friendly app that helps you locate jellyfish around you before you go swimming. 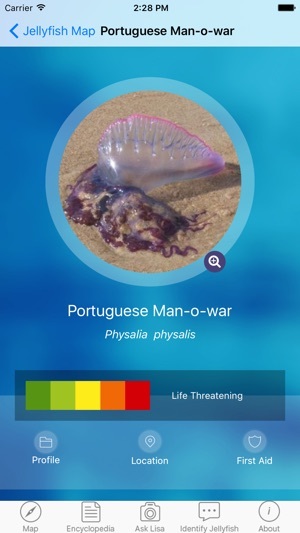 The app tells you what jellyfish species could be nearby and the level of danger that particular species presents. It also lets you look up jellyfish anywhere in the world! It's worth the $2 to get the pro version bc you can snap pics of any jelly fish you see and the world renowned expert in jellyfish Dr. Lisa will get right back to you. Best feature of the app is the warnings that are posted live for your beach. Love it! 5 stars !